“What a lot of clues!” was our first reaction. Then we noticed a very strange unching pattern, not only a couple of double unches in the perimeter but also eighteen open lights. Something was going to happen in this grid to justify this very unorthodox grid. At least, the open lights would render solving somewhat easier, as those eighteen solutions would be spelled out by the letters already in the grid. What’s more, the double unches would never get past the editors unless they were inevitable because of the endgame or some gimmick – so we were prompted where to look when we had a full grid. Indeed, solving was rendered easy and, after a quick scan through the clues that revealed a fair bit of fish, cheese, fruit and even served up wild goat but not much confirmation of Calmac’s membership of the Listener Oenophile.org, I had a hard time keeping up with the other Numpty, who solved the clues almost in order, so fast that I hadn’t time to sharpen my pencil. 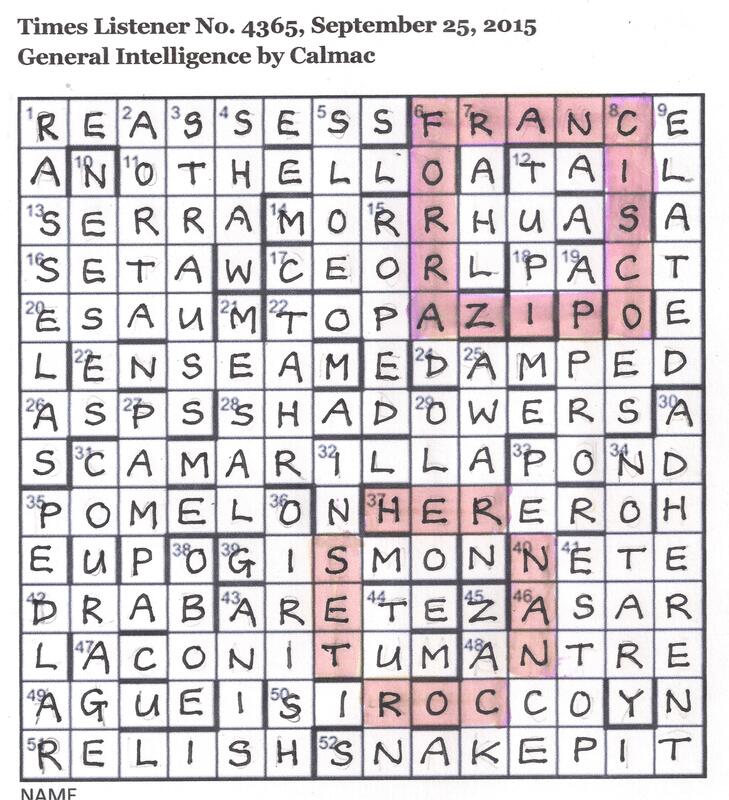 We were certainly solving a crossword that was intended to encourage Listener newcomers, as we noted an unusual number of hidden clues: ‘PhilippiNE TEnor holds highest note (4)’, ‘Poetical cave featured in AsiAN TREatise (5)’, ‘Birds kept by ManchuriAN ISlamists (4)’ and ‘WaltZ ACKnowledged in paRt Victorian dated bit (4)’. Generous anagrams helped us too: ‘The stalk of a moss capsule out in East (4)’ (giving SETA) and ‘FRee from excess fat before ripped seamen (6)’ (giving ENSEAM). Several words seemed redundant but the reason for a certain clunkiness in the clues wasn’t obvious until we had a full grid (a little over an hour) and a message spelled out: CENTRAL LETTERS IN CLUES. Indeed, that message had caused us the occasional hiccup along the way. We avoided the obvious pitfall of using the corrected letters (Oh yes, we have been there before!) and took the ‘incorrect’ letters, but the fact that these were scattered in any part of the clue, even in the materials of an anagrind, ‘Conspirers against ministers call Marie bent (9)’ (the anagram requiring CALL MARIA to give CAMARILLA) gave pause for thought. It looked like a laborious task, but, in fact, finding just the beginnings of words EVE.. SCH… KNO.. WH. IMP….. MONT… gave us all we needed and Google confirmed that ‘Every schoolboy knows who imprisoned Montezuma and who strangled Atahualpa‘. So that was why there were so many clues! I had to work out the end of the message where double letters were central to the clues, giving the …DA TA HU AL PA. This was indeed an original way of conveying the message – the first time we have seen it – and, of course it justified a certain clue clunkiness. This entry was posted on 16 October 2015 at 4:00 pm	and is filed under Solving Blogs. Tagged: Calmac, General Intelligence. You can follow any responses to this entry through the RSS 2.0 feed. You can leave a response, or trackback from your own site.